This is an opportunity to develop your motor skills, deepen your self knowledge and to explore the tricks and skills of a new juggling tool. You can learn more about how acts upon your being in our psychology guide , or learn about it through our workshops. FlipyFlux will become part of the decor of your home, and you will be surprised to find yourself playing with it when you are talking on the phone, reflecting on an important issue, or you when your body is feeling stiff.. It is relaxing and aids you to discover new sensations and movements, there’s no need for batteries, you can take it anywhere and use it anytime, sharing joy and well-being with anyone close by. Consists of a 8.20m, stainless steel flattened wire, intertwined in a particular way and painted. It is painted by an advanced technique that ensures attachment and lifelong effect. 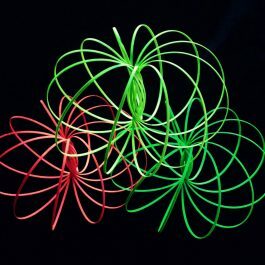 FlipyFlux Flourescents not only respond to ultraviolet light but also glow in the dark when charged in day light. Due to the complexity of their shape, minimal areas may appear in the inner zone, where the paint does not cover to perfection. 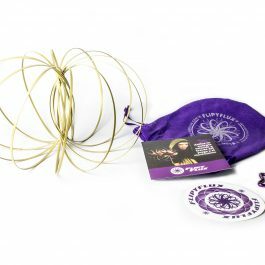 FlipyFlux comes with a specially designed carry bag, a star shaped carabiner so you can take it with you anywhere and everywhere, a sticker and an information leaflet. It conforms to directive 2009/48 / EEC and has CE Marking which categorizes it as a toy. The authentic FlipyFlux has the brand name engraved in laser tech next to the welding point. This welding is performed by electropoints and is guaranteed for life. Consists of a 8.20m, stainless steel flattened wire, intertwined in a particular way and painted. It is painted by an advanced technique that ensures attachment and lifelong effect. Due to the complexity of their shape, minimal areas may appear in the inner zone, where the paint does not cover to perfection. 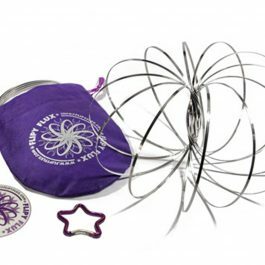 Consists of a 8.20m, stainless steel flattened wire, intertwined in a particular way. When closed it looks like a lot of hoops, but when opened, becomes a singular geometric shape, a torus.